There's something to be said for the BBC. When they take a novel and do an adaptation, they don't insist upon squeezing it into a 2 hour film. This 4 part adaptation of the George Eliot novel of the same name was so good that my dentist couldn't resist watching while he was supposed to be working on my teeth! I wont give away the story - that would be rude. If you enjoy a good period piece add it to your Blockbuster or Netflix queue! Tonight I had the pleasure of spending some time with Leonard Cohen. He's earned his title of "Man with the golden voice". He's quite a card, and yet not full of himself. 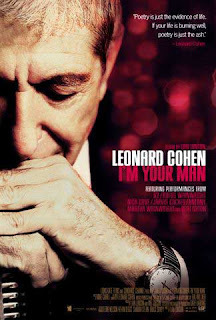 I'd seen other films, documentaries on Leonard, and there were very few minutes of repeats in this film. Part of what makes it so enjoyable is others singing his songs. Nick Cave, Beth Orton, Bono, Anthony, The Wainwrights, and Jarvis Cocker - to name a few. If you can watch/listen to this and not get chills at some point your soul has already died. It's funny, interesting, beautiful, odd. No link this time. Add it to your Blockbuster or Netflix queue. Go here. Definitely. Take a day, or better, take two. The house and surrounding shops are worthy of a whole day. The gardens and surrounding areas area worthy of a day, too. They have an inn, a winery, and other odds and ends to keep you engaged for a couple of days, easy. Asheville is beautiful on it's own. The drive itself is awe-inspiring, rather than tedious. Face it, nobody wants to drive around in some of the other vacation desitnations in our Country. Who wants to drive around the surrounding areas of DisneyLand or DisneyWorld? Not I. 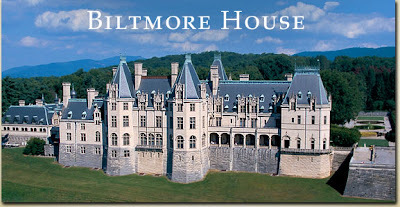 When it's the Biltmore Estate getting there is fun.The House is fabulous inside and out. There is so much to see, you have to work hard to see it all in one day. It's just grand. 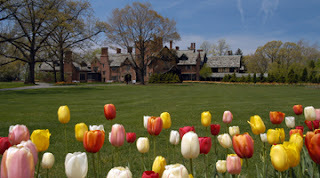 What other way can you describe places like The Biltmore, Versailles, Stan Hywet, etc? It's awesome to stand in the big old library and see how many books they had. We would love to have a library like that at our house! Go, explore, have fun, create memories. I wont bore you with all they have to offer. 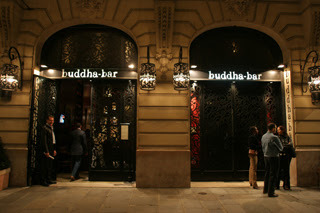 From the outside, the Buddha Bar doesn't look much different than anyplace else in the neighborhood. I sort of wondered why we were headed into the place at all, not being big bar hoppers. I was told it's a place to see and be seen in Paris. A late night hot spot where people like Madonna like to hang out. I like to explore new places, so I wasn't about to protest, but I didn't expect to be impressed. I say expect to be impressed. Plan on going and having a lot of fun in an energetic crowd. They eat, they drink, they dance. Mostly, they socialize. 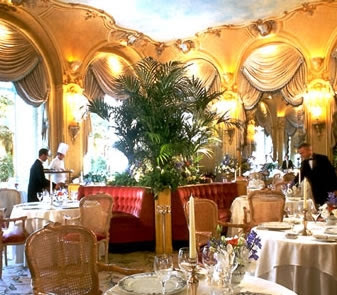 The Ritz in Paris is a dining room heard of all over the world. Royals eat there, movie stars eat there, men doing business eat there.When I was there I saw couples and men in business suits. I dont think any of them were royalty or movie stars. If you sit in one of the rounded red booths in the center of the restaurant, like we did, you feel like your'e in a fish bowl - and everyone's staring at you. They do stare. I tried to convince myself they were just trying to figure out what movies we'd starred in. It's a bit overwhelming for my standards to be stared at by strangers the whole time I have my meal. Especially when I managed to make a sugar cube do circus tricks, although I'm sure that wasn't the fault of the oglers. Be sure to take a trip to the ladies/gents, as even the restrooms are worth a look. If you want to say you've been to the Ritz, go ahead and go. I'd never try to dissuade you. It's an experience worth having. 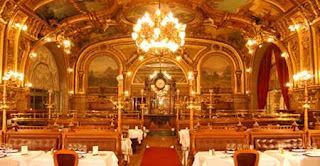 But I'd vote for Le Train Bleu if I had a choice between the two. 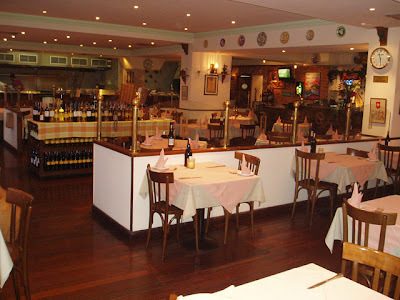 One of my two favorite spots to eat in Maracay is the restaurant at Hotel Italo. 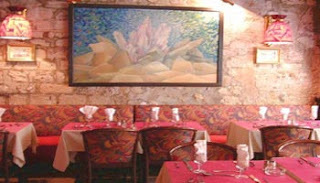 They have a great menu, wonderful waiters, and the place was always clean and neat. My husband didn't seem to mind their wine list, either. I used to choose their salmon a lot, with a side of fettucini Alfredo, and a lemonade frappe. Their calzones and pizzas are a treat, too. They have a nice kids menu, with a Mickey Mouse pizza generous enough to feed two children. Yes, I know it's expensive, but I'd rather go to Chanterelle once a year than McDonalds 25 times a year. The cost of either alternative is the same. They treat you like you are special from the moment you walk in the door. The whole place feels like it's lit with special lights made exclusively for the Waltucks. It's magical. The people at Chanterelle have a masters degree in presentation. On top of being delicious, everything is wonderfully arranged and adorned. Turnberry claims a spot in The Leading Hotels of The World. One visit will show you why. It's grand by most any standards. It's one of those places that could have been uncomfortably stuffy with the wrong management and staff. They did a good job hiring the right people, and have created a comfortable resort. The onsite dining is on par with the rest of the fine dining in the area. Even the food ordered through room service is outstanding. I'd suffered a pancake trauma (something to do with a helpful child exchanging salt for sugar in the recipe) and their banana pancakes helped me to recover. From the time you drive up and leave your keys with the valet you'll notice the folks at Turnberry haven't missed a thing. They've been generous with the gorgeous marble from the check in areas to the perfeclty appointed, spacious guest bathrooms. This may be my all time favorite bathroom away from home. You go to a different country and you expect to eat different cuisine, right? 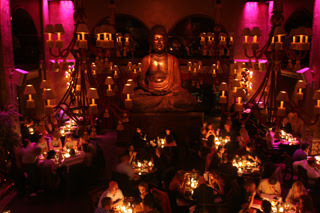 How about going to London and getting awesome Thai Food? 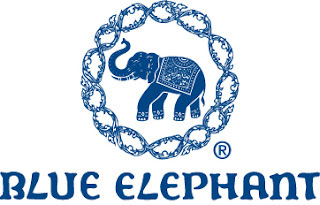 That's The Blue Elephant. Leave it to graceful Aunt Margot to takes us to such an exquisite place. She's transplanted to London for some 30+ years now. This was a fabulous restaurant. It's the kind of food that makes you lose your self control and eat way more than you normally would. It's so worth it. Everything about this place is exquisite, right down to the ladies room. The hand towels are adorned with the elephant design above. Do you have a picture of the place you got engaged? This is mine. The only thing is, we were still on the other side of the curtain, in the living area. 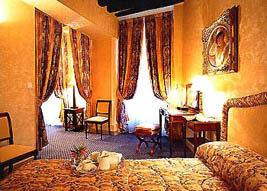 For the first couple of nights in Paris we stayed at The Hotel Residence Des Arts. There was a restaurant downstairs, part of the hotel. This hotel on the left bank gave us a different part of Paris within walking distance than the little apartment in Sacre Couer. 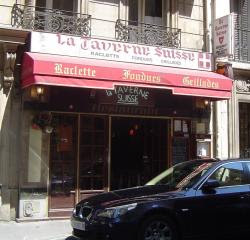 For a real dining experience I recommend La Taverne Suisse. We had delicious melted cheese, nearly a fondue, with big chunks of boiled potatoes. Our waiter was quite a... character. As he stood behind the counter across from our table he amused himself by making a rather large show of playing with (and I'm not sure you're ready for this) his boogers. A HUGE show. Luis had to harshly chastise him more than once before he finally, begrudgingly, agreed to quit. Do boogers make melted cheese better? We may well never know. 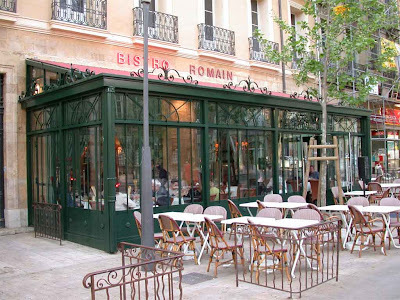 Try it for yourself at48, rue de Ponthieu, in Paris. 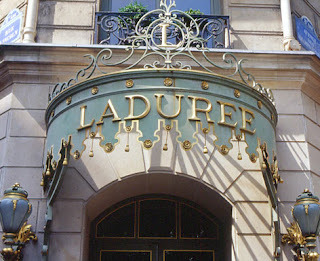 Right there at 73 Champs Elysées75008 Paristel: 01.43.59.67.85. There's another one further down the avenue at 122 Champs Elysées75008 Paris. The meal must have been good too, but honestly, who can remember? 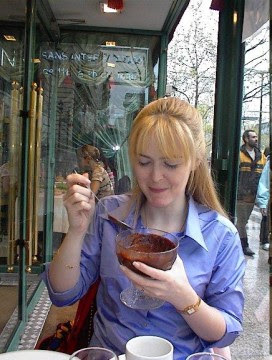 It was like a bowl full of the best brownie batter ever. The Louvre. Go to the museum. Stand in awe of the Venus de Milo. Adore the Mona Lisa. Dining in the Louvre, however, leaves much to be desired. The people are well dressed, as they are many other places, but the decor and food are just so-so. It's missing that special something, both in the kitchen and in the dining room. Even the chocolate mousse was disappointing. The gift shops, on the other hand, are almost worthy of a whole day themselves. There are fantastic things for sale downstairs, but especially upstairs. The day we went to the Louvre, the museum workers were on strike, so we didn't have to purchase tickets, and the lines were moving at warp speed. 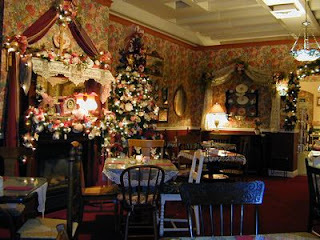 The most unusual thing about it was all the people using flash photography in there, with nobody on duty to stop them. Are you surprised the museum was open for visitors with nobody to protect everything? I was. According to Frommers, the famous people who have sat in the "Pleasure Garden of the Lilacs" include Gertrude Stein and Alice B. Toklas, Ingres, Henry James, Chateaubriand, Picasso, Hemingway, Apollinaire, Lenin and Trotsky (at the chessboard), and Whistler. The bartender was perfectly happy to answer our Hemingway questions and tell us about his favorite places to sit. We didn't see anyone famous, as far as I could tell. We seemed to have caught many lovely, large families with adorable children enjoying brunch. It's a beautiful setting for a sunny day, which is how we got to enjoy it. 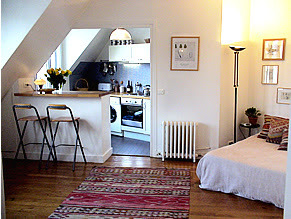 It's walking distance to Luxembourg Gardens. What better way to walk off a meal? While we're in Scotland, let's talk about another little jewel. Errolbank Guest House in Dundee. It's a crying shame Doris doesn't have more pictures online. The ones I can find don't do it justice. I can tell you it's a charming guest house. There is a beautiful garden with a quaint sitting area. I became quite a fan of the Scottish breakfast while I was in the care of Doris. The Scots don't fool around with breakfast- what an indulgence! It's hearty and delicious. I can't find a picture to do her breakfast justice. It had three kinds of meat, eggs, baked tomato, baked beans, toast, & tea. Possibly oats and potatoes. Who can remember oats or potatoes after all that other stuff? I found Dundee to be a great town for a girl with some time on her hands. It feels safe and friendly enough to walk around and discover on your own. There's Dundee University, the ocean, (we picked up some black sand, something to do with an extinct volcano, for my father in law), City Square with plenty of shopping including a fantastic book store, and the Discovery ship. Don't let your teenage daughter go there on her own, though, as Dundee has the highest rate of teen pregnancy in Western Europe. A whopping 1 in 16 girls! Of Dundee's 115,000 tourists per year, only 15,000 are said to come from outside the UK. I spent a fabulous birthday evening dining at Murrayshall in 2001. We'd set out to dine at a castle, but that wasn't to be. Our driver suggested Murrayshall as an excellent alternative. It met all of our expectations. 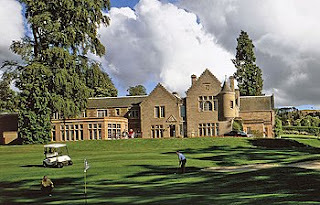 Murrayshall is famous because of its' beautiful golf course, but the dining leaves nothing to be desired. We were as well taken care of by Katherine, our beautifully freckled, red headed waitress as we've been anywhere we've dined. The food was excellent and the view was stunning. They've a beautiful grand piano in the dining room, which led to quite a bit of playing, and then singing, by the other group in the dining room. They had come in happy and hungry from the beautiful golf course. After drinks and dinner and dessert, there was a round of happy birthday, led and sung by the other friendly patrons. If I had to choose between The Ritz Paris or Murrayshall, I would choose Murrayshall every time. There was lots to love about the small part of Scotland I was able to see. This place was quite lovable.